It occurred to me while making this, that I've made two dishes from Jerry Traunfeld's The Herbfarm Cookbook and both included tarragon. Which is significant, because I don't cook with tarragon much. It doesn't seem to have quite taken this country by storm. As I was chopping the herb for this recipe, I thought it smelled like vanilla. But as anyone who's tasted it knows, it thinks of itself as anise's more sophisticated older sibling, sharing that same distinctive essential oil tasting of licorice, but combining it with an herbal headiness and mouth-awakening spiciness. All of this from one little herb. When buying tarragon, you should look specifically for French tarragon, as opposed to Russian tarragon, which is not as potent in flavor but is easier to grow. The Russian type will have lighter colored leaves which will be longer, even over two or three inches. If you can get the good stuff, you'll be rewarded. 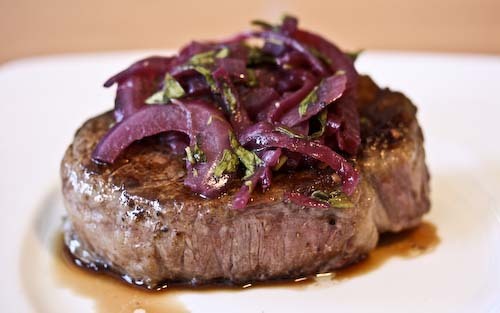 And about this dish, I know there's a recession, and so what am I doing preparing filet mignon at home. I mean seriously. But these steaks (and several more cuts, actually) were Christmas gifts from my family. Lucky little girl. If you're not interested in steak, R ate the leftover relish on potatoes and they would be a unique, assertive addition to a sandwich. Heat the oil in a medium saucepan over medium heat, then add the onion, sugar and salt. Cook until the onion is soft, but not brown, stirring often. This should take about 5 minutes. Add the red wine and allow the liquid to gently simmer until evaporated, stirring often. About 5 - 10 minutes. Add the vinegar and tarragon, stirring briefly. Season with salt and pepper, then set aside. Season both sides of the steaks with salt and pepper. Don't hold back, do this like you mean it. Heat the oil in the pan over high heat until the oil starts to smoke. Carefully place the steaks in the skillet using tongs, and cook on the first side for about 4-5 minutes. Flip once that side is a deep brown. Continue to cook on the other side until done to your preference. This was about another 3-4 minutes for me (medium rare). Transfer the steaks to a warm plate and allow to rest for 5 minutes before serving. To serve, mound the relish on top of each steak and enjoy. * Remember to bring your steaks to room temperature before cooking so that they heat evenly. My goodness does this relish look delicious, and the filet mignon, to die for. Simply heaven on a plate. That is a fine piece of fillet, phillie! Red onions are oh so sweet, be it raw or cooked. Love tarragon, and this is a much healthier way to have tarragon with steak than bernaise! That steak looks so delicious. The relish looks wonderful! We don't eat too much beef, and I bet it would be good on pork! That is one delicious fillet, and tarragon sure it make it tastier. Tarragon is such a delicious herb, I don't understand why people don't use it more. That fillet looks heavenly.